Whatever your uniform, you should always wear a friendly smile. Being a receptionist is no slack job. Even when it's the most entry-level position in a company, the job requires you to maintain a certain level of professionalism, and to follow certain rules of etiquette. If you're considering working as a receptionist, keep a few basic guidelines in mind. 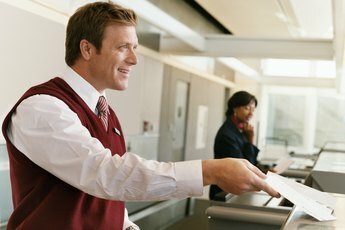 A receptionist's primary duty is to receive visitors and to send them to the appropriate place in the building; in other words, receptionists must be the hospitality crew for the workplace. That includes smiling and greeting each person who enters the office. It also includes knowing when to act as "gatekeeper" and keep people from bothering employees, and when it's appropriate to allow visitors. To do this well, the receptionist needs to know each person's workflow and needs. 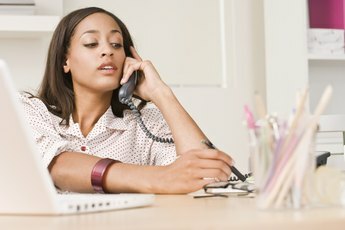 Receptionists are typically responsible for dealing with the phone calls -- and sometimes the generic emails -- that come into a workplace. They need to know proper phone etiquette. Naturally, this means being friendly and welcoming, but also knowing which calls get sent to an employee's voice mail and which ones get directly connected to the receiver. This delicate matter takes a lot of good judgment and communication among receptionists and staff. Since they're often the first person a client or customer sees, another important factor for a receptionist is her attire. Receptionists need to maintain the same level of professionalism as the other workers in the office. If it's a law firm where workers wear suits and ties, the receptionist needs to do the same. Receptionists, just like secretaries or personal assistants, may be privy to a lot of sensitive information pertaining to the employees or the work a business does. They need to gauge when it's OK to talk about an employee's activities or work, and when to stay quiet. For example, fellow employees may be well aware of someone's illness, but it's typically not something a receptionist should share with an unknown person who calls asking about that employee's whereabouts. Ruby Receptionists: Is Your Receptionist a Gatekeeper or a Brand Ambassador? What Is the Importance of Good Communication Skills to an Administrative Office Manager?